HOT TUBS ALL MARQUIS SPAS Signature Series Vector21 Series Celebrity Elite Series Celebrity Series Marquis Hot Tub Features Hot Tub Health Benefits What Is Hydrotherapy? DROP IN FOR SOME FUN! Celebrity Elite hot tubs feature stainless steel jet faces for that bling, a larger 50 sq ft filter and energy-saving foam over plumbing insulation. Optional features include in-line sanitation system for additional levels of water care treatment, plus full foam insulation keeps water warm and operating costs down. Want some drama? Enjoy a light show with multi-point LED Twilight lights. You can also get a great looking coordinated Elite step to dress up the whole look of your patio or deck. The Woodstock Elite is party central with seven seats for seven attendees. The lounge features epic hydrotherapy from neck to feet. A super-deep therapy seat addresses the thighs and calves, plus five more positions. The star of the show is the explosive Whitewater-4 jet water wall. 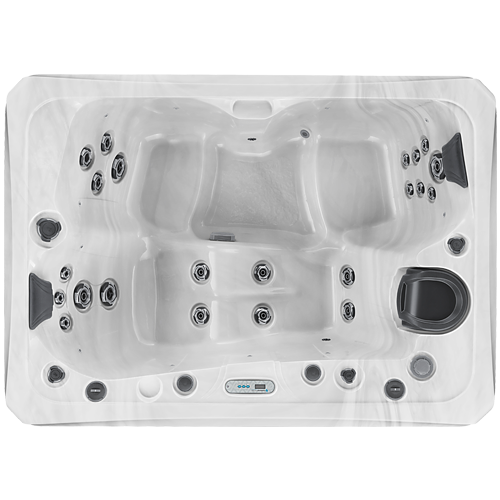 The Vegas Elite hot tub’s unique seating positions provide comfort for six people and include two deep therapy seats, two side seats, one mid-level seat, a super-deep soak seat and a bonus entry step. But the real excitement is from the Whitewater-4 jet's explosive leg therapy and water wall! Stainless steel jet faces and foam-over plumbing come standard, with the option to add full-foam insulation. The Hollywood Elite accommodates a party of six. The generous seating includes a laid-back Lounge with jets from neck to legs, two deep therapy seats with full back therapy, two bucket seats, and a high therapy seat. Plus a Whitewater-4 jet with zone control will rock your world! Add Twilight lighting, Motown audio with Bluetooth and matching step and turn up the volume on your hot tub party! You'll feel like you just won a Tony Award when you slip into your Broadway hot tub! The creative seating arrangement features a wraparound seat for two, a super deep Director's Chair with fantastic leg therapy, another deep seat for total back therapy and two more seats at varying heights. Everyone in the house will enjoy the performance. Plus its plug-n-play system is a great convenience. The Monaco Elite accommodates a party of five. This throwback to the round hot tub days has a generous lounge with jets from neck to feet, two deep therapy seats with full-back therapy, and two bucket seats. With the convenient 120 volt plug-and-play system, you can locate it just about anywhere. Stainless steel jet faces and foam-over plumbing are standard. Perfect by yourself or with a companion, Nashville Elite offers the luxury of a day spa in your backyard. It's a premium two person hot tub that lets you lounge as you whisper to your partner in the therapy seat next to you. The cool-down seat provides a third spot to linger. 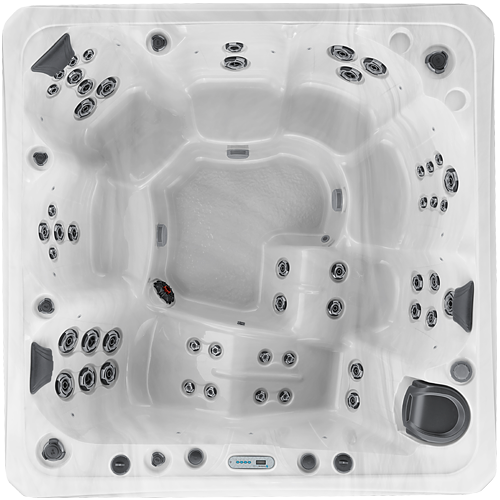 And an optional 240V performance upgrade further enhances your hydrotherapy experience. Sign up with your email address to receive the latest hot tub news and updates.